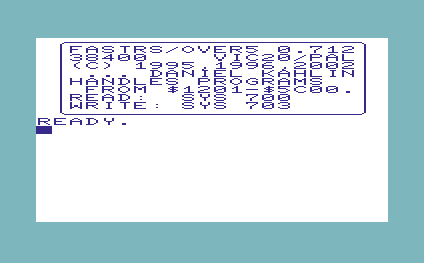 Over5 is a c64/vic20 < - > Amiga/Pc/Unix-box transferring program. It supports serial transfer at 38400 bps using only a RS-232 level converter (like the VIC-1011A RS232C or the Handic V24 interface) and a 3-line standard nullmodem cable. NO special serialport chips needed! 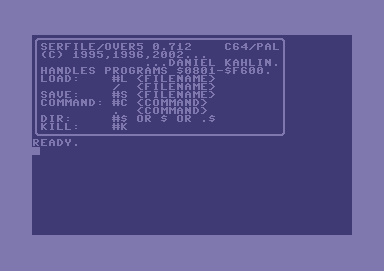 Over5 is written and maintained by Daniel Kahlin. Linux port and Track read/write routine by Andreas Andersson. Win32 port by Martin Sikström. Over5 logo on this page by Patrik Wallström. over5-20021117.tar.gz - Over5 snapshot distribution (development). This is a long due release of many improvements. The code now has autoconf support, works on atleast Unix systems and Win32 systems (using MinGW32). The Amiga code has been removed from the source tree. Memslave is now runtime relocatable and has the option to install a reset server. Vic20 fastrs is now runtime relocatable making it work under any memory configuration. The bug that prevented SIMPLEREAD working on Win32 systems has been fixed. The bug that required the current directory to be writeable when running over5 in server mode has been fixed. Major clean up with completely new directory structure! Experimental kernal patches are included (serfile and memslave in kernal). Added a description on how to build an interface. Newer snapshots and other interesting projects may from time to time appear on Andreas' project page. NOTE: Some things (mainly over5 server) only work with filenames consisting of capitals. Martin has also done excellent work on reverse engineering the Expert Cartridge on Martin's C64 Pages. Over5_0_711.lha - Over5 0.711 Amiga distribution. Over5_0_711.readme - Over5 0.711 Amiga readme file. Over5 is targetted for the plain c64, c128 in c64 mode and vic20 only. It additionally requires (and supports) only a user port serial adapter and a null modem cable. Serial Slave: A tool to run your PC as a harddisk server for your Commodore (similar to the SerFile function of Over5). It supposedly works with an REU and/or SuperCPU. It requires you to have a SwiftLink, Turbo232, Silver Surfer or similar cartridge. Written by Per Olofsson. Jeff's 1581 Emulator Project: This project is a software modification of Over5 to provide an interface for "c1541" allowing you to use a linux box w/floppy drive as a 1581 device with your 64/128. Modifications written by Jeff Ledger. dasm-2.12.04.tar.gz - Macro assembler needed to build the 6502 parts of over5. Originally written by Matthew Dillon, improved by Olaf Seibert. cbmconvert-2.1.tar.gz - Convert between different Commodore file formats. (zipcode, lynx, d64, etc...) Written by Marko Mäkelä. d65-0.2.1.tar.gz - Disassembler for 6502/6510 binaries. Written by Marko Mäkelä. petcat-1.9.tar.gz - lists c64 basic programs. Written by Jouko Valta.